I just spent the past week down in Florida, a very hot place to be in August, but it was a trip I had to make. My sister and I had to pack up some of what we wanted from my Mom's condo. I was very happy to have, among other things, her pots and pans and a few remaining cookbooks that I didn't get last time I was down there. One of the books she had was put out by the American Heart Association called, " Lowfat, Low-Cholesterol Cookbook". With all the baking I do I have to admit I could use some low fat, heart healthy recipes!! This dessert recipe I tried today actually came out very good. There was still brown sugar in it and a little bit of veggie oil ( I used canola oil ), but the book says one serving has 127 calories and a serving is about a 2 inch by 1 inch piece. So if you're looking for a lighter, lower fat dessert, give this one a try. BTW, it calls for a jar of strained baby food applesauce..why not just regular applesauce? Maybe the sugar? Spray a 9" square pan with vegetable oil spray. In a mixing bowl, combine oil, brown sugar, applesauce and vanilla. Add oats, nuts, baking powder and cinnamon. Mix til blended. Press mixture evenly and firmly into prepared pan. Bake 20 to 25 minutes or til edges and golden brown. Cut into 36 squares. I was only about 10 years old when my Italian grandmother, Jennie, died. I do have lots of special memories of her and I remember most vividly her Italian cookies she would make in the shape of an "S" which I always thought was for my name !! And I guess it was !! Lidia Bastianich is one of my favorite cooks and I really think it's because she reminds me of my grandma Jennie. I just love watching her show on PBS. As she cooks her delicious recipes, she has wonderful stories and it makes you just want to jump into the TV and sit down with her and eat!! So when I was searching for a certain Italian cookie recipe the other day I came across one of Lidia's cookbooks in the library. I grabbed her book along with about 4 others and made copies of several cookie recipes. 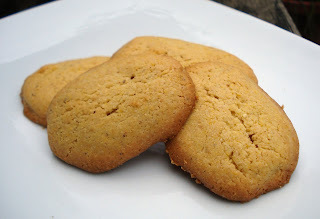 This Cornmeal Cookie recipe is from one of her cookbooks but I did see the recipe online which brings me to my dilemma. The recipe I followed in her book has a typo!! They left out a very important line in the directions where you're supposed to add the butter !! I had the dough all made when I looked over and noticed the butter still sitting on the counter!! Yikes...so I just dumped the dough back into the mixing bowl and mixed the butter in. It came out fine. I baked a very small batch first and refridgerated the rest of the dough for about an hour. The first batch of cookies came out a little flat and too dark on the bottom because the oven temp. called for in the recipe was 400. The next batch was well chilled and I formed them into little logs and lowered the oven temp. to 350. They came out much better. I do think they could have used a little more flavor, perhaps some lemon or orange zest? But they do have a nice crunch from the cornmeal. So I guess the moral of this story is to be sure to read over the entire recipe before starting...and, yes, she's still my favorite cook, baker whatever !! I know...sounds a little crazy, right?!! Well, one of the markets I do was having a kind of cookbook exchange, take one...leave one...that sort of thing. So I found a 1980 Southern Living Annual Recipe Cookbook and started looking over some of the recipes when I came upon this odd combo. Now, I've been known to bake some unusual ingredients together, like my zucchini spice cookies or the rhubarb cookies so why would this be any different?!! 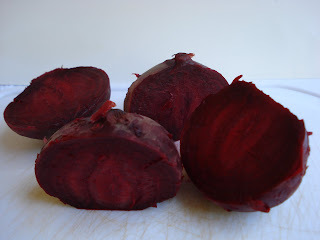 Also, since my youngest son Kris loves beets I knew this had all the makings of a winner recipe!! And yes, I was correct. This cake came out very chocolatey and moist and...no, you don't taste the beets!! Just look at it. I love the color, too! It has chocolate chips in it to give it more chocolatey flavor but the beet red color still comes through. So give it a try and don't tell anyone the secret ingredient!! They'll never know they're getting vitamins, nutrients and antioxidants with each bite!! Grease a 9 inch square pan. Preheat oven to 350. Combine flour, powder,salt and cocoa; set aside. In a large mixing bowl, combine eggs and sugar. Mix well. Add beets, oil, orange juice and orange zest to sugar mixture; beat well. Stir in flour mixture and vanilla, mixing well. Pour into pan and bake at 350 for 40 minutes or til cake tests done. Let cool 10 minutes in pan. Remove from pan and cool completely on wire rack. Well I'm still having fun playing with my new "toy"...my food processor, that is! 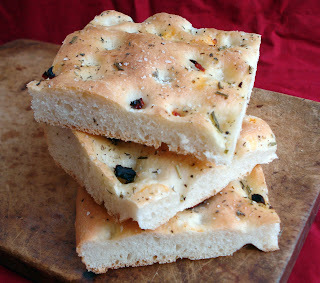 I thought I'd make pizza dough next but I saw they had this recipe for easy focaccia in the recipe booklet that came with the processor so I gave it a try. Easy?? Wow, that's an understatement!! It took more of my time to clean the processor bowl afterward than to make this!! Sure I had to let it double in bulk twice, but all I had to do for that was wait! And look how pretty! 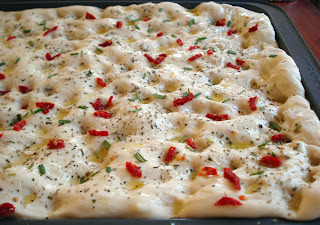 The dough comes out light and airy and depending what you sprinkle on top it has great flavor. I used some sun dried tomatoes I had in the fridge with chopped fresh rosemary and some dried Italian herbs. I also sprinkled some kosher salt on top for a little crunch and extra flavor. The sun dried tomatoes did get a little darkened in the high heat of the oven but we can always pick them off later! Look at that dough before baking..bella..no?? Such pretty colors !! chopped fresh or dried herbs, sundried tomatoes, olives, etc. (optional). Combine 1/3 cup warm water with yeast and a tsp. of sugar in a 2 cup measure with pouring spout. Stir to dissolve yeast. Let it rest 3-10 minutes til foamy. ( If it doesn't foam, the yeast is not active. Discard and begin again with fresh yeast). Using the dough blade, place flour with 3 tbsp. olive oil and 2 tsp. salt into the work bowl of processor. Process to blend 10 seconds. Add cold water to yeast mixture, stir to blend. With machine running, add the liquid through the small feed tube in a slow steady stream, as fast as the flour will absorb it. When liquid is absorbed and mixture has formed a ball of dough that has cleaned the sides of the bowl, process for 45 seconds longer to knead. Coat dough with 1/2 tbsp. olive oil. Place in a resealable zip lock bag, squeezing out the air and seal, allowing space for dough to rise. Allow dough to rise 1 hour in a warm, draft free spot. Spread 1 tbsp. of remaining oil in a jelly roll pan(15 x 10") . Punch dough down and let it rest 5 mins. Press dough into pan until it fills it totally.Cover with sheet of oiled plastic wrap and let it rise again 1 hour. Preheat oven to 450F . Make dimples in the surface of the dough with your fingers. Drizzle with remaining oil and smear with your fingers. Sprinkle with coarse salt and herbs. Bake about 20 minutes or til deep golden. Baking just got a little easier...Yeah!! Ever think back to a time when you didn't have something you now take for granted, like your cell phone or your computer and wonder how you ever lived without it? Well, the rainy weather, once again, gave me a "free" day today ( no farmer's market) so I decided that it was high time for my next small appliance purchase to make my life a little easier!! Yup... I am now the proud owner of a food processor!! A 14 cup processor to be exact !! I drove to about 5 different stores before I realized the first store I stopped in was the best deal. I couldn't wait to get home and make something with it!! I read the recipe booklet that came with it and chose the basic pastry since I had been taught by my Mom how to make a great pie crust by hand but with this machine...what a snap!! The crust came out so very good and so very easy. Yes, I'm so used to slaving over everything I do , whether it's baking or crafting or painting...or whatever. It's as if I don't spend tons of time working on a project it just won't be good. Boy was I wrong ! You should have seen me in my quilting days. I actually started out making quilts by sewing each piece by hand , then doing all the quilting by hand..Yikes!! Life's too short, ya' know?!! 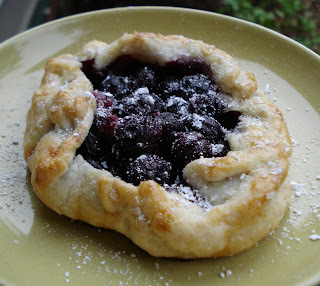 Since I only had frozen blueberries, I made a few small rustic blueberry tarts. 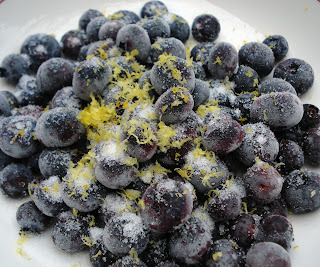 I just sprinkled the frozen berries with some sugar, lemon zest and cornstarch , made the dough, chilled it and rolled it out, filling each with the berries. I brushed the dough with a little beaten egg and sprinkled coarse sugar over top and baked. The crust is quick, easy and delicious!! Hmmm...wonder what I should try next. Maybe pizza!! Wondering what to do with all that zucchini multiplying in your garden? Well one of our local farmers markets wondered the same thing and decided to have a zucchini recipe contest. 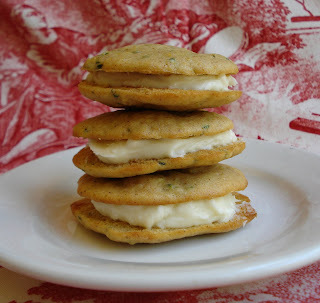 I searched for some interesting cookie ideas and came up with this one...but the idea of zucchini whoopie pies intrigued me so when I saw ( and tasted ) these cookies, once baked, I decided to make them into sandwich cookies...kind of like a whoopie pie ! They actually have a nice flavor with the addition of orange zest. So go out to your garden, grab some zucchini and get bakin' !! Cream butter and sugar in bowl of mixer. Add orange zest. Combine dry ingredients in bowl and mix. Mix dry ingred. alternately into butter/sugar mix. with milk. Stir in nuts and raisins if using. Bake 12 - 15 minutes. I made mine 2 different sizes. For a larger size cookie ( approx. 4" ) drop by rounded tablespoonfuls. Beat all ingredients in a small bowl and sandwich between 2 cookies. 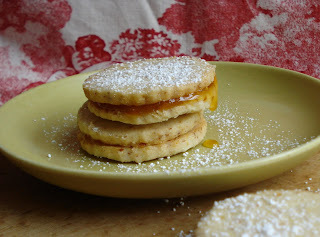 Sandwich Cookies...One Retro, One Contempo! Ok, first I feel the need to explain my last post ! Our local newspaper was having a Julie/Julia contest, which, for some crazy insane reason, I felt driven to enter!! Like I don't have enough to do! We had to choose a recipe from one of her first 4 cookbooks , make it and submit it in a blog form, so I chose the gnocchi. Anyway, needless to say, my entry was either disqualified( I am not technically an amateur cook, as the rules stated, but I do "make a living" as a baker...I guess you could call it"a living"!! I mean, cook and baker are 2 different things, aren't they?? Or they just plain hated my recipe choice! Well anyhoo, I did it and I'm proud of the results...but I'd never ever make it again. Ok, enough explaining! Oh yes, one more thing...because I haven't posted anything for a while, I thought I'd include 2 recipes today. You know, kind of making up for lost time!! I was in my local library quite a few months ago, maybe even close to a year ago by now and I was looking through the magazines when I came upon a magazine entitled " Hallmark". I'd never heard of it,( which doesn't mean much as it's probably been around for years) and they were featuring cookie recipes that some readers remembered growing up. This one for a cookie called " Double Crunchers" looked very good so I photo copied the recipe, went home and made it. I decided, for whatever reason then, to swap out the chocolate filling for Nutella and this cookie became one of my favorites...along with everyone else who tried them!! Nutella is soo good!! 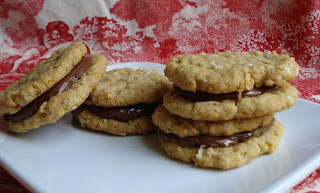 I love the flavor of hazelnut and chocolate together and it just works so well in this cookie. I searched everywhere in my recipe file for the original photo copied recipe from that day and...do you think I could find it?? NO!! So as I was looking through a 12th Grand National Pillsbury Bake-Off Cookbook I had in my piles of cookbooks, there is was! And, here it is !! This next sandwich cookie recipe is from an older issue ( June 2006) issue of Martha Stewart's Magazine ( my thrift shops come through again!) This recipe is entitled " Lemon-Apricot Sandwiches". I should always remember that any shortbread cookie made with cornstarch or powdered sugar is going to come out much softer and way more crumbly than a shortbread cookie made with white granulated sugar. This one was no exception!! I just didn't like the softness of it. The flavor was nice but I thought the apricot jam overpowered the lemon flavor in the cookie. Biting into it, it all fell apart. This one didn't make me happy!! But give it a try...maybe you like a soft shortbread cookie?! Sift: 1 cup AP flour, 1/2 tsp. soda, 1/4 tsp. salt. Set aside. Mix in mixer with paddle attachment: 1/2 cup firmly packed brown sugar( I used light), 1/2 cup sugar,1/2 cup shortening. ( yeah I know!). Cream well. Blend in: 1 egg , 1/2 tsp. vanilla. Mix well. Add dry and mix thoroughly. Stir in 1 cup corn flakes, crushed( 1 cup measured before crushing).. 1 cup quick cooking rolled oats, 1/2 cup coconut. Shape into balls. Place on greased cookie sheets( I experimented with one greased sheet and one sheet w/ parchment paper. The parchment worked out much better.) Flatten each cookie with fingers to about 3/8" thick. Bake 8 - 10 minutes. (Mine took a few minutes longer). When cooled, spread one cookie with filling and top with another cookie.